Obviously the Breen and possibly the Cardassian rebels (True Way for you STO fans, given their border is in out AoO) are a source of enemies however given the turmoil and confusion there could be other interested parties looking to seed trouble for their own gains, probably something to look into for the second season? What about a not so friendly reprise of our first contact species? how about a race of Sith? Danny Sullivan wrote: how about a race of Sith? Sadly BF rules disallow that one Danny. I'll knock up a kind of Mass Effect styled Codex entry for a template and we can add and subtract. You forgot to say, "I must go." Besides every time I try to use Vulnians in something it goes badly. Somehow the Xindi could be brought back maybe? 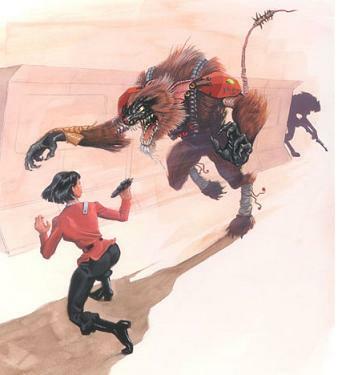 Anyone know anything about the Kzinti at all? I like this idea here is a link to some info on them. Richard Wayne wrote: I like this idea here is a link to some info on them. Yeees, obviously there's no real reason for them not to be a threat given how the Federation has been so busy all of a sudden. Well with us working so hard to help the Romulans and all it is a perfect time for them to start grabbing more space or just being bad. I think they were originally a Larry Niven creation, I dunno how they ended up being a brief mention in Star Trek's Animated series. I've even used their looks in another equally brutal race the Asi in another RP for an original sci-fi plot.